For over 25 years, ServiceMaster Restoration & Cleaning has been the name to trust for comprehensive natural disaster restoration in Summerwood, TX. We know natural disasters can happen at any time, day or night, and without fast action, the damage will only get worse. As the damage becomes more extensive, the restoration becomes more expensive. We provide a wide range of disaster restoration services for residential and commercial clients for all kinds of situations. Our technicians are fully trained in the latest restoration techniques and are IICRC certified, in accordance with guidelines set by the ServiceMaster Restore Quality Restoration Vendor Program (SQV). We use only the most advanced cleaning equipment and products available in the industry, so we can be sure we’re offering our customers the best service possible. ServiceMaster Restoration & Cleaning provides services to residential and commercial clients of all sizes, and we support the Summerwood community in the aftermath of large-scale natural disasters. Angie’s List rewarded us with their Super Service Award, and the Better Business Bureau has given us their Award of Excellence three times. Fire Damage Restoration: Fires are dangerous because they move so quickly, so the most important thing during any fire is to evacuate the area and call 911. After the flames are out and injuries are managed, call ServiceMaster Restoration & Cleaning. Don’t be lulled into a sense of complacency because the fire has been extinguished; corrosive elements like soot, fumes from burned synthetics, and firefighting chemicals can cause as much damage as the flames, if not more. The damage will continue until the remediation process begins, so it’s important to call quickly. Our technicians have the training and experience to rebuild fire-damaged areas, as well as restore items you thought might be beyond repair. Smoke and Odor Mitigation: Pets, sewer backups, smoke, and mold can make your entire home reek. Once these smells get absorbed into textiles and furnishings, they’re almost impossible to remove without professional help. Blankets and slipcovers can go in the washing machine, but not upholstery or rugs. Air fresheners and fabric refreshers will only cover the smell for a while, at best. Service Master Restoration & Cleaning uses advanced equipment and cleaning techniques to remove even the worst smells from your home or business, as well as the original source of the odor. We can restore expensive or heirloom furniture that experienced a pet accident, or remove the smoke smell that lingers after a fire. Water Damage Restoration: Whether it comes from a tiny crack in a wall or a gushing pipe, water inside the home is nothing but trouble. It spreads quickly and is absorbed even faster into building materials, textiles, furniture, and other items. The longer the water sits, the more it spreads and causes damage, so it’s important to call ServiceMaster Restoration & Cleaning We remove excess water and moisture, dry the entire area, and restore any damaged items to prevent further structural damage as well as mold growth. Depending on the severity of water damage in your home, our plans are customized for your home’s needs. If you have questions about the water damage plans offered, call our emergency service number. 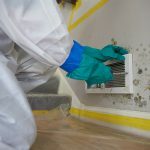 Mold Remediation: Cleaning mold by yourself can be dangerous because many people don’t realize they’re allergic to it until there’s a breakout in their homes. Without proper protective gear, it’s too easy to expose eyes and lungs to irritating spores. Commercially available cleaners aren’t strong enough to kill mold, so it’s best to leave it to experts like the ones at ServiceMaster Restoration & Cleaning. We’re licensed by the State of Texas to provide comprehensive mold remediation, including evaluation and mold testing, to ensure all traces have been removed. Any time you need disaster remediation services in Summerwood, TX, call the highly trained professionals at ServiceMaster Restoration & Cleaning. We’re available 24 hours a day to respond to emergencies of any size and we work with your insurance company to process your claim quickly and efficiently. Call us at (800) 303-5844, 24 hours a day, 7 days a week, for high quality disaster restoration services.